STURGIS, S.D. - West River was not missed in the Governor’s budget address Tuesday. Daugaard has proposed spending $3.8 million to help fund construction of an Army National Guard aviation facility in Rapid City. Also include is $1.8 million to renovate a building in Sturgis that would serve as the state Metrology Lab. The Sturgis plan would move the current facility out of Pierre. The lab would be moved to an existing state owned building on a Department of Transportation complex, and would be renovated to serve as the lab’s new home. The State Metrology Lab validates equipment used by state employees to enforce standards for measure devices, like scales that are used to weigh trucks. 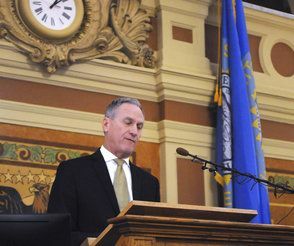 Daugaard said Tuesday that a new home is needed for the lab to keep it certified and in compliance with national standards. Currently, the lab is located in an unsuitable space in Pierre.